By unflinchingly chronicling her life’s peaks and valleys, Olivia Newton-John explodes myths about pop superstardom. The Australian singer is a gifted storyteller. Her unguarded prose pulls us in as closely for her endearing childhood memories of familial bliss as for the devastation of her parents’ divorce, and guides us gracefully through the roller-coaster ride of her career and her battle with cancer. Ultimately, Newton-John’s survivor story inspires a new appreciation for her perpetually sunny demeanor—and made us want to do a better job cultivating our own attitude of gratitude. I’ve been an Olivia fan since I first saw Grease when I was 9 years old. This book was better than I could’ve imagined. Olivia’s outlook on life, her friends, family, and animals is an inspiration. Her desire to love and create love in her world is something we should all strive to do. It is no surprise to me that’s she’s every bit of wonderful that I thought she’d be (and more). Thank you Olivia for writing this memoir and for letting us in on the good, as well as the challenges you’ve experienced. I listened to it on audiobook and loved that she told the story herself. It was like listening to a pal. Thank you Olivia for being exactly who you are. You are a champion. We honestly love you. Have find this story in book store, very interesting learn about this. After see on Fox 17 help people all ages, and story of ones live though this, few story video clip was interesting but one hit me hardest child younger age stage 4 and pray and talk others about his health. But later die last year Nov. 28 2018. Nice learn Ronald Mc Donald house we’re ones stay until children of all ages get well. It was call RMHC Nashville. Com help out . Let’s all help others in times, god will bless you though years. So glad she still hanging on. Gift of life. Truly amazing artist and talented singer and songwriter and more. God bless Olivia Newton John. And amazing actor. On Grease film movie. 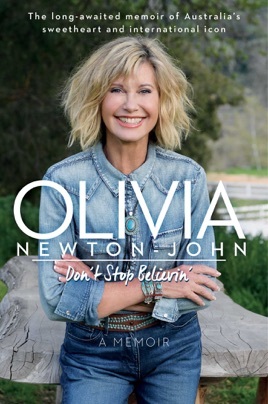 Olivia Newton-John has been an inspiration throughout her life and career. Her beautiful music takes us from workout to meditation. Her passion for environmental and animal welfare leads us to care and support the same. And now, as she wins over her battle with cancer, we are all reminded that no matter how bad the day might be - it WILL “hurry by” and we can all remain strong and on course through our own life’s journey.